This year has been one of explosive growth for Artists Circle! We recently hired Austin Bristor as our new Installer & Project Assistant. You’ll see him at installations with Dan or helping Jack, Katie, and Olivia with client presentations. His can-do attitude and bright disposition makes him an important and valuable addition to our team. Read about Austin below! Where did you grow up? I’ve lived in Mt. Airy since I was one year old. What bands are you in and what instruments do you play? My main musical endeavor is my solo project called “Avstin” which has taken various shapes over the last five years. It’s allowed me to dive into various genres and atmospheres for different occasions and opportunities. I’m planning on releasing my debut self-produced album as Avstin by late Spring / early Summer this year! On this album I perform all of the instruments and tracks myself such as: vocals, guitars, bass, synthesizers, and drums. I also play bass in a really fun indie-rock band out of Mt. Airy called Flooring. What do you do in your free time / on the weekend? I enjoy living an active lifestyle. On the weekends you can generally find me running, hiking, taking day/weekend camping trips, or exploring new towns, music venues, and wilderness areas. Do you have any pets? I have two Bernese Mountain Dogs named Nanna and Bear who are a BIG part of my life. They are litter mates and turned 3 years old last week. What’s a ‘did you know’ fact about yourself? A couple ‘did you know’ facts about me is that in the future I wish to continue my education in either architecture and/or civil engineering, and I’ve eaten a vegetarian diet for about 6 years now. If you’re ever in the Frederick or Mt. Airy areas, keep your eyes open to see if Avstin playing a show near you! Welcome to the team, Austin! We are THRILLED to share some installation photos from our recently completed public art project in Alexandria. Our services were enlisted by Gables Residential to commission and install a unique and site-specific sculpture outside of a development at 530 First Street in Alexandria, VA. After vetting dozens of artists, we selected Tom Fruin, who is known for his large-scale public sculptures using salvaged glass and Plexiglas to create odes to local building structures and neighborhood histories. 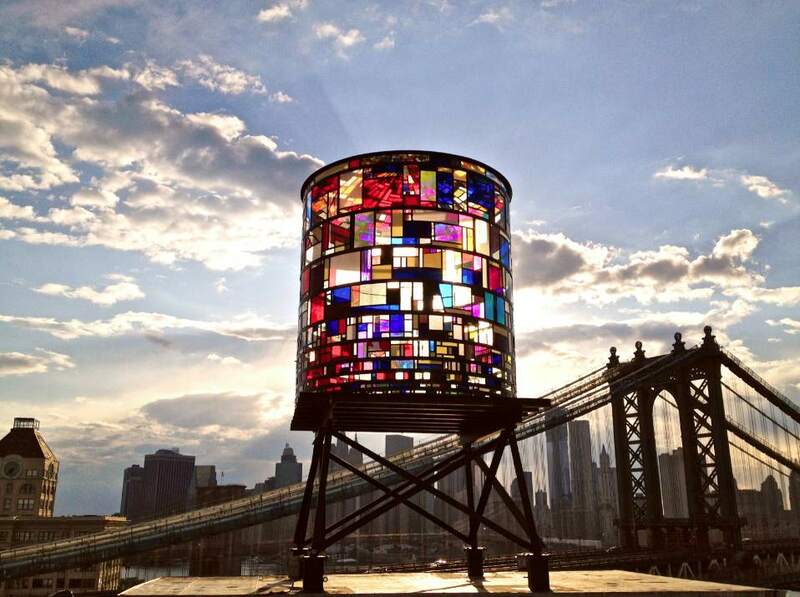 The image below, entitled ‘Watertower’ is one of his iconic artworks, adding a colorful and historically relevant addition to the Brooklyn skyline. Fruin conducted site surveys and consulted historical documents when creating his design for the Alexandria project. The site is located right next to the Potomac River as it winds its way into DC. To pay homage to the River’s historical significance as a transportation and commerce route, Fruin made the canal structure the integral theme of his design. Historical reference: stacked stone canal wall from the 1800s. 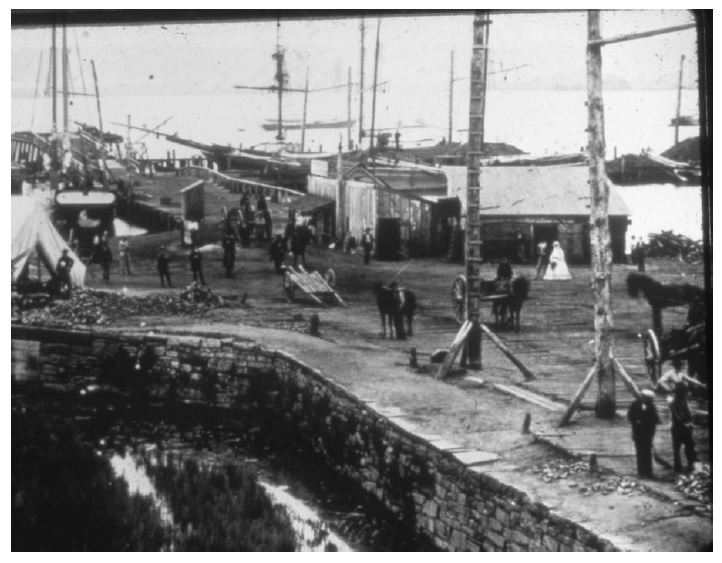 The vertical structure is an eye-catching piece to be viewed in the round as visitors approach and leave the development while hearkening back to the site’s history.The Plinth sculpture is a distillation of the historic "stone walls" built to shore up the area. The irregular square shapes can be read as stones while the entire structure can be seen as a cross-sectional quarried piece of earth with veins of sediment. Illuminated from within, the glowing structure is a contemporary monument to land on which it sits. Steel sculpture frame in Fruin’s fabrication studio in Brooklyn. Panels prior to on-site assembly. Raising the sculpture on-site with some panels installed. Inside the sculpture. 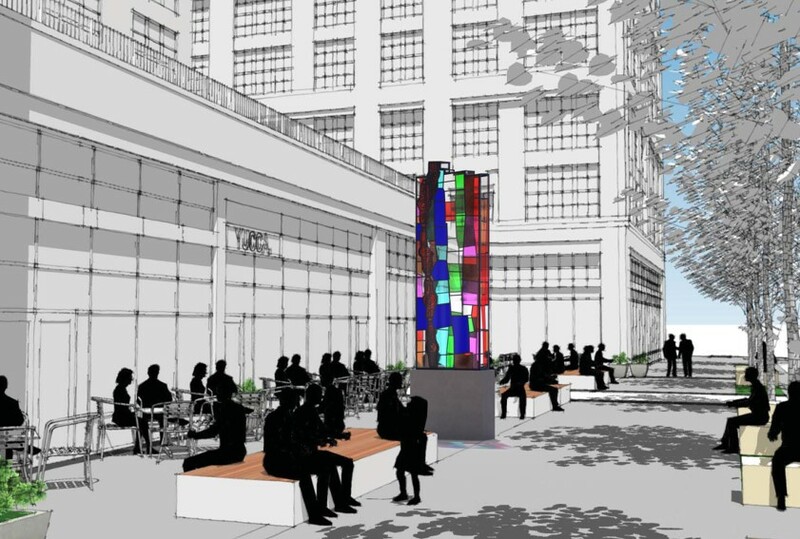 Interior lighting will cast a gem colored glow across the plaza at night. Our lead installer, Dan, has been working on a plethora of projects in recent months. 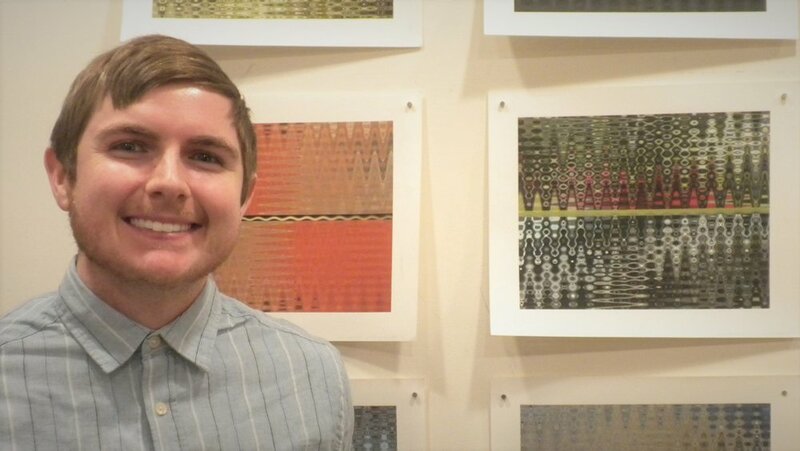 Dan has several repeat clients who rely on him for custom artwork and framing jobs. Some of these projects involve framing and mounting of portraits, swapping out plaques, or creating interesting wall layouts for graphics or series. 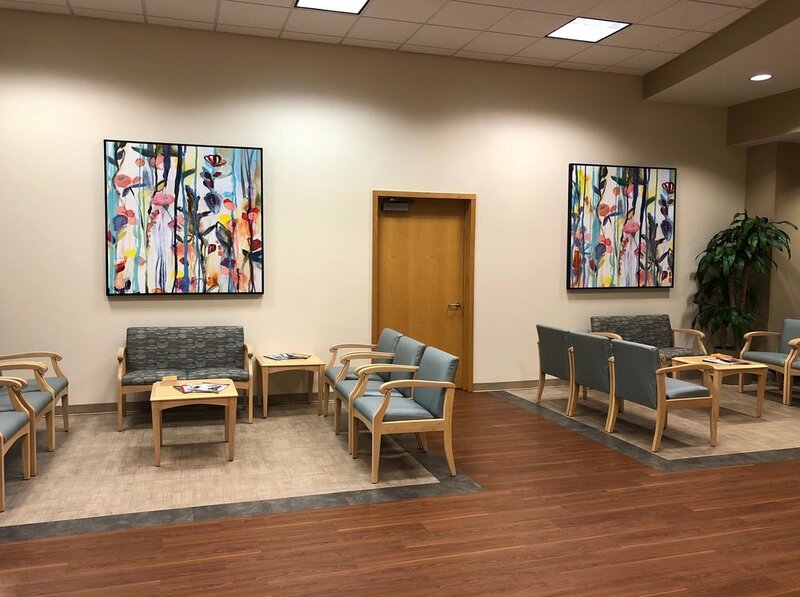 Our installation projects vary anywhere from hanging a single piece in an individual’s office, to installing several hundred pieces within a few days’ time. Although we normally only post our large scale projects on this blog (i.e. public art, sculpture, and custom art), the our installation business continues to thrive and grow! If you or you business needs assistance with artwork transport, storage, or installation, Dan is your guy! You can reach him at dan@artcfa.com. It’s our favorite time of year! A time for family, friendship, and an opportunity to reflect on all of the many blessings in our lives. Too often we find ourselves caught up in the workplace whirlwind, noses to the grindstone (…or computer screen), trying to churn out our work as quickly and efficiently as possible that we forget to take a step back and really reflect on the hard work that we’ve done. This past year, we’ve been able to collaborate with architects, designers, artists, and clients from Los Angeles, to Dallas, to Chicago, to Boston, to Fort Lauderdale, and back home in Washington, DC. 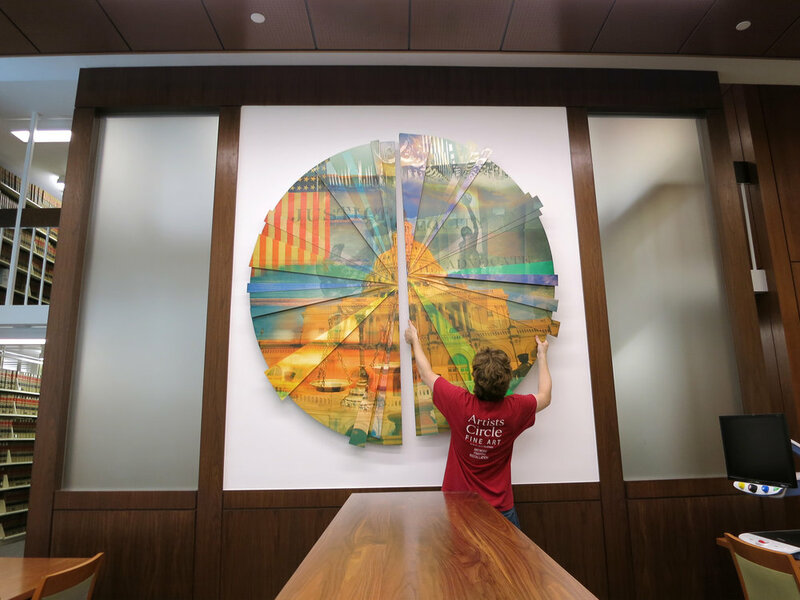 We’ve worked on everything from small framing projects, to temporary rotating artwork displays, to acquisitions for permanent collections, to large scale public art installations. See below for a review of some of our favorite projects from the last year. We are so grateful to everyone that we’ve collaborated with this and every year to bring these projects to life. From Artists Circle, to you - HAPPY THANKSGIVING! Last week we wrapped up an interior mural for our friends at The Goldstar Group. Their new office in Bethesda was designed by our other friends at American Office. This mural was hand-painted using 35 screens and over 100 layered images of DC old and new. Being a commercial real estate investment firm, the client wanted to feature iconic scenes from around DC to capture their primary market. We are DROOLING over the detail & texture here! A 20th century map of DC layered underneath a photograph of the client’s new office in Bethesda, all sealed underneath The Goldstar Group’s logo?! Yes, please! DC old and new can be seen in this portion of the mural. Imagery includes the new development down at The Wharf, the iconic ceiling of the DC metro system, and various retail storefronts and signs from around the city. Viewers can travel through the DMV’s past, present, and future in this mural. Many thanks to The Goldstar Group and American Office for bringing us on board! We love the nuanced approach to the commission above. 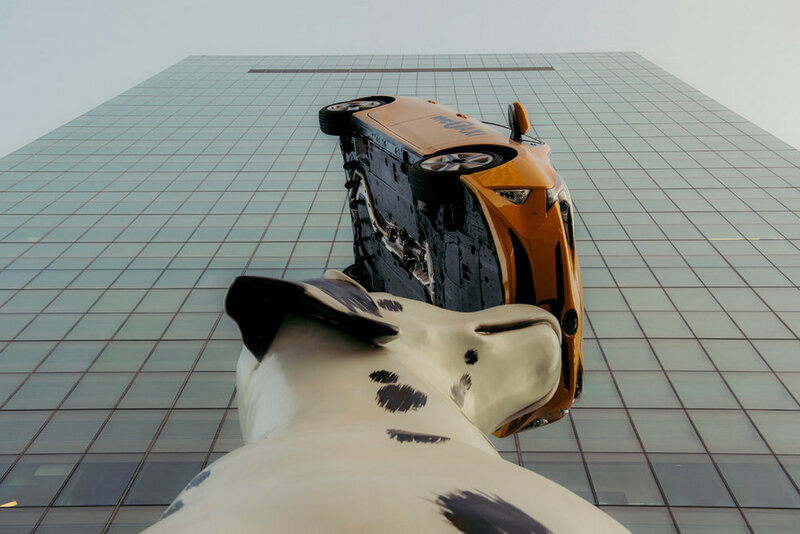 Public art is incredibly powerful in that viewers often discover new elements in the artwork each time they encounter it. At first place, passerby might think the sculpture is just cute, whimsical and playful. But upon further reflection, the piece invites them to consider the focus, intention, and confidence displayed by the dog. Below are some of Artists Circle’s current public art projects - check out the captions for the story behind each one! Sculptural proposal for a soundwall at a development in Rockville, MD. The artist uses recycled aluminum panels to create dimensional wall sculptures that can be installed in interior or exterior spaces. This piece balances Rockville’s present with the past - the old barn harkens back to the town’s history as a farming community while the contemporary construction alludes to Rockville’s new center as a business and cultural hub of the DMV. ‘Discovery’ creatures in progress for the Chevy Chase Land Company. Inspired by origami, these sculptural animals are made of recycled, museum-quality metals and will be installed throughout the shopping center. Some large, some small, the sculptures are intended to be discovered by shoppers for a bit of whimsy to be enjoyed by young and old alike. Glass tower on proposal in Old Town, Alexandria. The artist was inspired by a lime kiln found in archaeological surveys of the site. 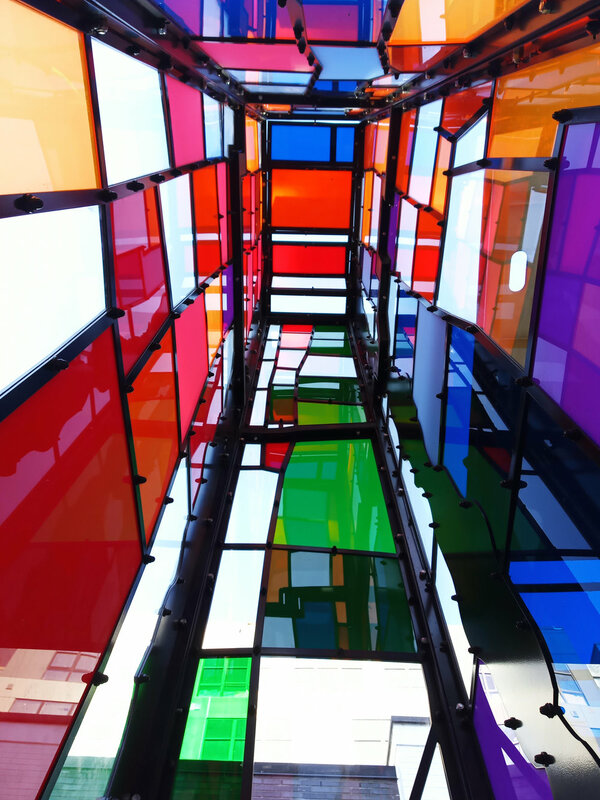 The bright, colored glass will provide a contemporary take on a historical object. Perusing the morning art news on Hyperallergic, I (PM, Olivia) saw a feature on a new exhibit at thte Brandywine River Museum of Art in Chadds Ford, PA. The exhibit, entitled Natural Wonders: The Sublime in Contemporary Art, provides commentary on the ways in which the natural world and the artificial world have blended together in the age of technology. Is nature still real if you see it through a television screen? It is still authentic if the plant is in a pot inside a home, or in this case a museum, rather than outside in the wild? These questions relate to a trend that we’ve seen in our projects over the last several years. We’ve had a number of clients express interest in incorporating natural elements like moss, leaves, and stones, into their interior offices. Photos of flowers and and rivers are undoubtedly soothing and universally pleasing to viewers, but having a tactile work of art that people can touch, approach, and experience its dimensionality allows for an even deeper level of appreciation for the artwork. The Brandywine Museum’s curator, Suzanne Ramljak, reminds us that “80% of Americans live in metropolitan areas with little direct access to nature, and spend more than 90% of their lives indoors.” Because access to ‘real’ nature is so limited, we’ve found that many of our clients here at Artists Circle are excited about the idea of having natural or botanical artwork brought into their spaces. It serves as a taste of the forest in an otherwise concrete jungle. 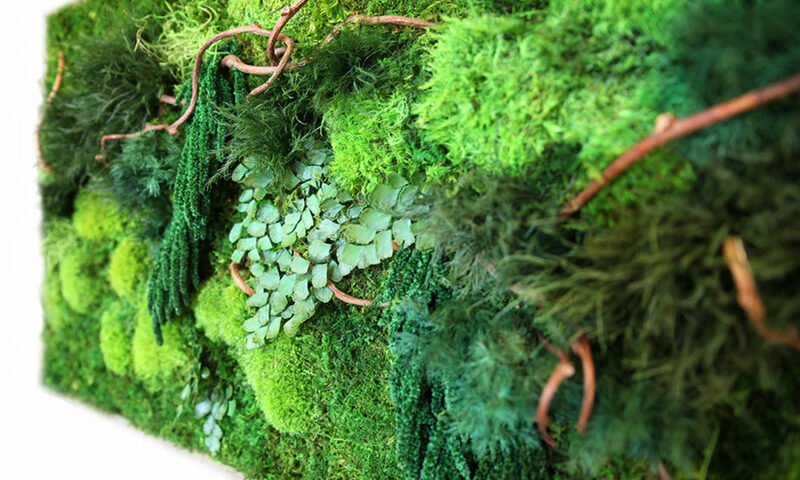 Check out some of our artwork projects involving natural elements below! Here’s hoping that we will all get to spend a little more time outdoors in the coming weeks (and that we’ll get to see the show at the Brandywine museum!). If not - we’re happy to bring natural, living artwork right to your office! Today's installation was at Suburban Hospital's Radiation Oncology clinic in Bethesda. 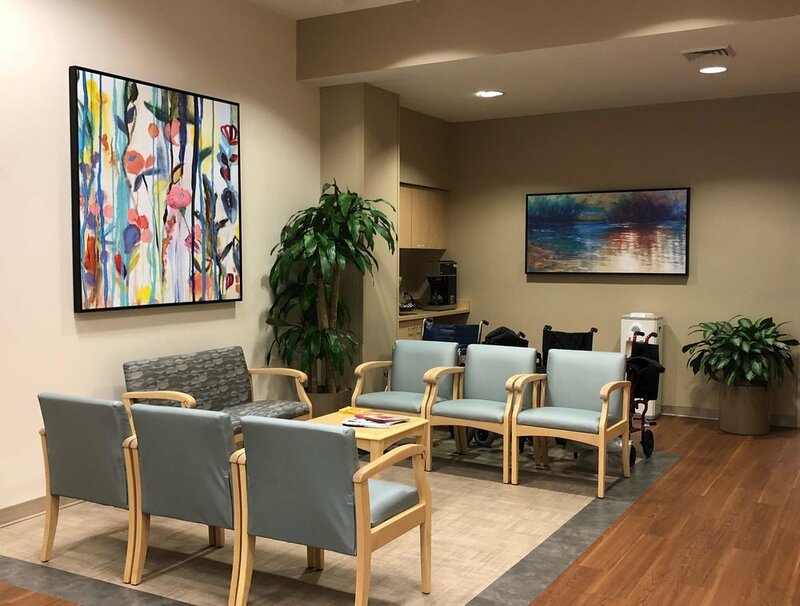 These botanical canvases were selected to brighten the space and soothe patients preparing for their treatments. There may be stormy weather coming our way today, but these bright and cheery images will provide a glimpse of brighter days ahead to anyone who passes them. Project Manager Olivia is hard art work developing concepts for a new corporate space at the District Wharf. 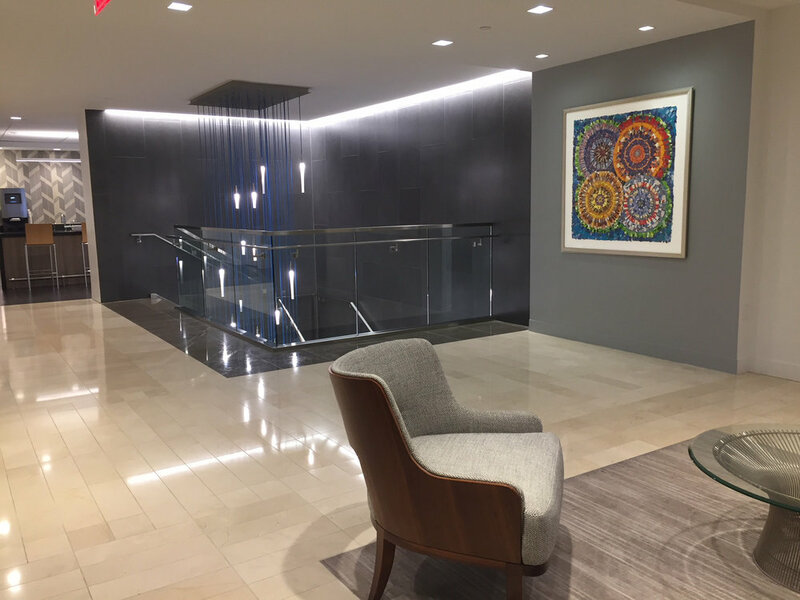 Since the office overlooks the Potomac River, the client is interested in wall-sculptures that have material or aesthetic connections to water. These are preliminary renderings, but Olivia plans to have the selected artist create a piece that ties directly to the path of the Potomac River as it winds its way into DC. A few of the concepts they're considering are below. Stay tuned to see which one they choose!